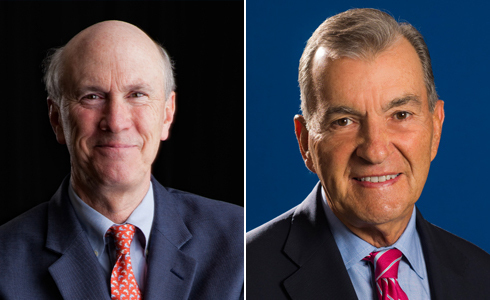 Savannah, Ga., February 13, 2019 – In celebration of the 286th anniversary of the founding of Georgia, United States Senator David Perdue and the Georgia Historical Society will induct Frank Blake, Retired Chairman and CEO of Home Depot, and John Schuerholz, Vice Chairman Emeritus of the Atlanta Braves, as the newest Georgia Trustees. The induction will take place this Saturday, February 16, at the annual Trustees Gala in Savannah. In conjunction with the Office of the Governor, the Georgia Historical Society reestablished the Georgia Trustees in 2008 as a way of recognizing Georgians whose accomplishments and community service reflect the highest ideals of the original Trustees, a governing body chartered and appointed by His Majesty King George II of England in 1732 to establish a new colony in North America. The modern-day Trustees are appointed annually by the Governor and it is the highest honor the state can confer. The 2019 Trustees Gala, “The Sapientia Society,” is the Georgia Historical Society’s premier annual event and the culmination of the Georgia History Festival. Each year, this elegant and much-anticipated evening draws top local, state, and national leaders to honor and pay tribute to the best the State of Georgia has produced. Previous inductees are Bernie Marcus, Ted Turner, Hank Aaron, The Honorable Sam Nunn, Vince Dooley, The Honorable Andrew Young, Tom Cousins, Herman Russell, Truett Cathy, Billy Payne, Arthur Blank, Paula Wallace, Alana Smith Shepherd, Muhtar Kent, James Blanchard, Paul Bowers, Ed Bastian, and Marguerite Neel Williams, who was honored posthumously.